Lt. Brad Wangler oversees the Patrol Division at the Flint Township Police Department. This division consists of 4 patrol sergeants and 23 patrol officers. The primary responsibility of the division is responding to 911 generated calls for service, traffic enforcement, traffic crash investigation, and daily citizen interaction. 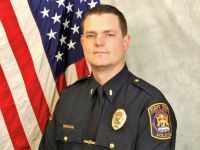 Lt. Wangler has been in law enforcement since 2005 and has served with the Flint Township Police Department since 2009. Lt. Wangler studied criminal justice at Michigan State University and holds his bachelor’s degree. Lt. Wangler is also a graduate of Northwestern School of Police Staff and Command- Class #432.